A rotor for the i-DCD drive motor. Daido Steel Co Ltd and Honda Motor Co Ltd report that they have achieved practical application of a hot deformed neodymium magnet containing no heavy rare earth which still has the high heat resistance properties and high magnetic performance required for use in the driving motor of a hybrid vehicle. This heavy rare earth-free hot deformed neodymium magnet will be applied first to the all-new Honda FREED. Neodymium magnets have the highest magnetic force among all magnets in the world and are being used for the drive motors of electric vehicles including hybrid vehicles, and therefore demand for neodymium magnets are expected to grow exponentially in the future. For use in the drive motors of electric vehicles, neodymium magnets must have high heat resistance properties as they are used in a high temperature environment. Adding heavy rare earth (dysprosium and/or terbium) to the neodymium magnets has been a conventional method to secure such high heat resistance. However, the use of heavy rare earth carries risks from the perspectives of stable procurement and material costs, the companies say. Therefore, a reduction in the use of heavy rare earth elements has been one of the major challenges needing to be addressed in order to use neodymium magnets for the drive motors of hybrid vehicles. Daido Electronics Co Ltd a wholly owned subsidiary of Daido Steel, has been mass-producing neodymium magnets using the hot deformation method, which is different from the typical sintering production method for neodymium magnets. The hot deformation method is a technology that enables nanometer-scale crystal grains to be well-aligned in order to realize a fine crystal grain structure that is approximately ten times smaller than that of a sintered magnet, which makes it possible to produce magnets with greater heat resistance properties. This time, Daido Steel and Honda jointly developed new neodymium magnets while Daido Steel evolved its hot deformation technologies and Honda revised the shape of the magnet. Through these joint development efforts, the two companies achieved, for reportedly the first time in the world, a practical application of a neodymium magnet which contains absolutely no heavy rare earth yet has high heat resistance and high magnetic performance suitable for use in the drive motor of hybrid vehicles. Honda has also designed a new motor which accommodates this new magnet. In addition to the shape of the magnet, Honda revised the shape of the rotor to optimize the flow of the magnetic flux of the magnet. 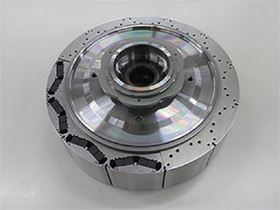 As a result, the hot deformed neodymium magnet that contains absolutely no heavy rare earth is suitable for the drive motor of a hybrid vehicle, demonstrating torque, output and heat resistance performance equivalent to those of a motor that uses the conventional type of magnet. Starting in August 2016, Daido Electronics will begin the mass-production and shipment of this magnet using a new production line in its Nakatsugawa City, Japan factory. This story is reprinted from material from Honda, with editorial changes made by Materials Today. The views expressed in this article do not necessarily represent those of Elsevier.